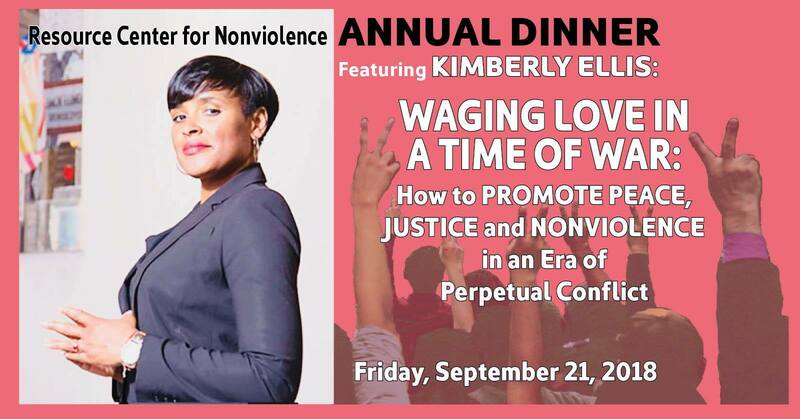 This past Friday, September 21st, gave way to a successful 42nd year of Annual Dinners for the Resource Center for Nonviolence. With a full house of over 150 people in attendance, our annual dinner was graced with entertainment by local musician Tim Brady of Cement Ship, a gourmet vegetarian dinner prepared by Eileen Balian and her wonderful volunteers, a program honoring the hard work of our beloved community, and a silent auction organized by RCNV volunteer, Dan Spelce. We were so fortunate to have Kimberly Ellis as our program’s highlight, a nationally recognized Progressive leader who has been credited with revolutionizing Democratic politics and has been called, “the most powerful unelected person in California Democratic politics.” She is the former Executive Director of Emerge California – the state’s most effective training program for Democratic women to run for and win elected office and has been frequently interviewed and quoted in political media, syndicated television, and radio. She spoke to Annual Dinner attendees on how to promote love, peace, and nonviolence during this era of perpetual conflict. 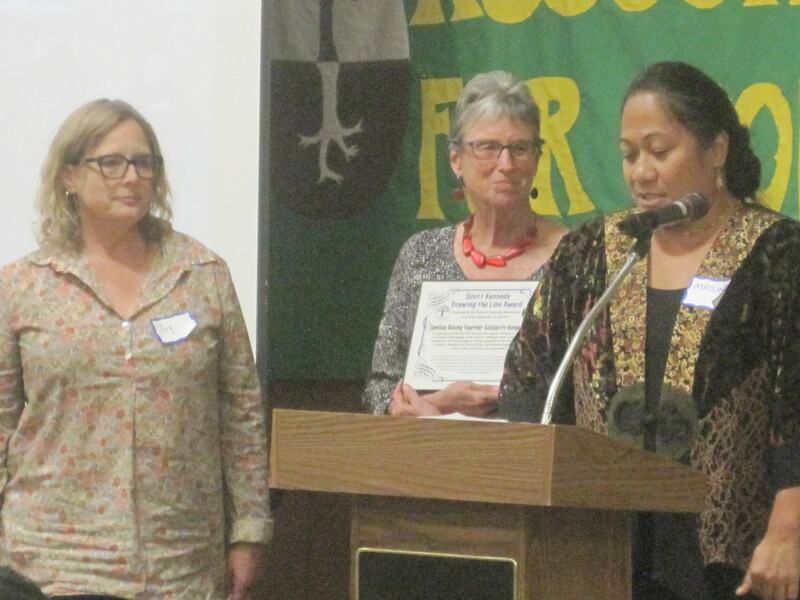 The Scott Kennedy Drawing the Line Award was created to recognize the work of organizations and their commitment to nonviolent social change. 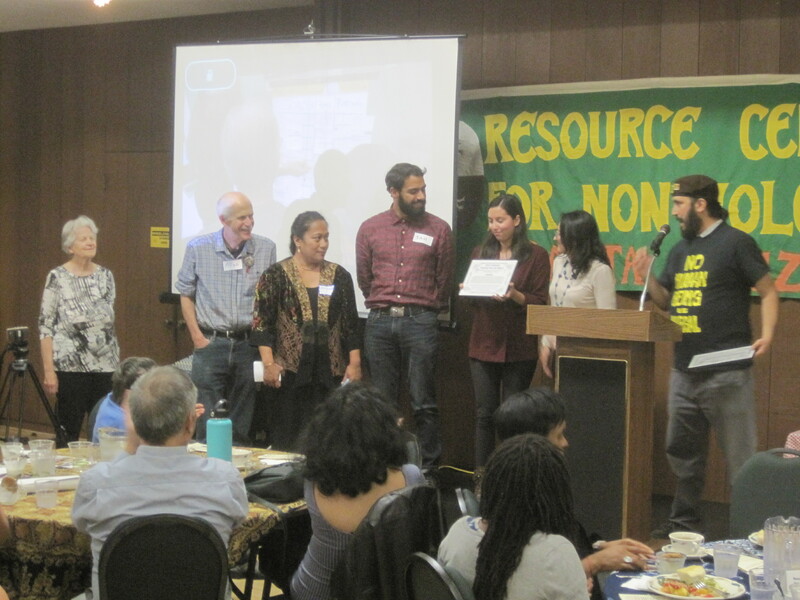 For 2018, the staff members of RCNV have chosen to honor two organizations: Cosecha Santa Cruz and the Soldarity Hunger Strike organized by Families Belong Together. Cosecha Santa Cruz has organized movements fighting for the protection, dignity, and respect for undocumented immigrants, encouraging the economic noncooperation of supporters of ICE with the ultimate goal of its abolition. You can learn more about Cosecha Santa Cruz HERE. Families Belong Together has been awarded for joining in solidarity with incarcerated migrant mothers to co-organize a national and local hunger strike, demanding “that every migrant family separated by this administration be reunited, released from incarceration, and receive support and justice for the trauma inflicted by our government.” You can learn more about Families Belong Together and their Solidarity Hunger Strike HERE. Our annual dinner’s success could not have been possible without the continuous support of our nonviolent community, our host and individual contributors, our business supporters, food donors, and our amazing volunteers for which we are immensely grateful. THANK YOU to our organizational hosts: Palestine Justice Coalition, Veterans for Peace/ARMISTICE100, Santa Cruz County Community Coalition to Overcome Racism, Women’s International League for Peace and Freedom, NAACP Santa Cruz County Branch, and The Boys Who Said No film. THANK YOU also to our individual hosts: Mavel Armijo, Steve & Jody & Patrick Carstens, Shalom Compost, Darrell & Karen Darling, Robert deFreitas & Gigo DaSilva, Alain Desouches, Eileen Donnelly, Shelly Errington, Ilene Feinman & Kenny Welcher, Robin Gaither- in memory of Don Matchan, Katharina Harlow, Amanda Harris Altice, Don Lane, Robert and Caroline Levering, Thom & Linda McCue, Kimlin McDaniel Keith, Sen. Bill Monning & Dr. Dana Kent, Gary & Marilyn Patton, Morgan Rankin, Roland & Patricia Rebele, William Rence, Nick & Ruth Royal, Patricia Schroeder, and Jeffrey Smedberg.